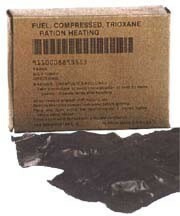 A very stable solid fuel and has an almost infinite shelf life. The military use's them as meal warmers. It burns steady with a hot, smokeless blue flame that can be used to warm hands and food, start a fire in windy conditions or with rain-wet wood. These fuel bars are a great asset for campers especially in cold and wet weather. Makes fire starting a snap with just one flit strike or touch with at match. Each bar burns for 5 to 7 minutes as whole peice. Best if bar broken into three peices and add the smaller peice in 2 1/2 minture intervals to keep steady flame for 11 minutes. Each box has 3 bars, which are individually foil sealed for safety and protection.